I am willing to bet very few have any idea what this post is about, because I had no idea this existed until I found their booth at the Fort McMurray Spring Trade Show. I imagine that is where a few others found them, too, and when they told me their story I was not only intrigued but delighted. You see this is a business initiative from some local high school students, and it is through a program known as Junior Achievement. I am familiar with JA because of my adult nieces and nephews, several of whom participated in this program in high school. JA takes high school kids and teaches them economics (a subject which personally frightens me because I don't understand it), but it does it by having those kids take the fundamentals and then found and run their own business. They have to come up with a product or service, create a business plan, and then do marketing, promotion, and operate the business. And to me it is an amazing thing to witness, because in a world that will need entrepreneurs I think the best way to create them is to teach them the basics when they are young and instil that sense of business savvy and sense. It allows them to "test drive" the concept of business ownership, and it has them working in a collaborative fashion with other students to operate a business (much like often happens in real life). Most importantly though I believe it gives them a sense of confidence and an understanding of the world of economics, a knowledge that even if they never do open their own business will serve them well over their lives as they understand how the businesses they deal with operate, and why. When I found the booth from our own local JA students I was delighted because I didn't even know we had a JA program here (and for many years it had died, only to be resurrected this year). And I was even more delighted because the product they have designed and decided to sell is one meant to introduce the community to the idea of composting, a concept which has for some reason been slow to grow here in northern Alberta. They have created small composting kits with instructions and are selling them for a very reasonable cost. The idea is to show people how simple it is to compost, and if you get people doing it on a smaller scale they will often do it on a larger scale, too. I have long been a fan of composting, as it is a way to minimize our ecological footprint, and what is particularly lovely about the business venture from Great Green North is that the concept aligns very nicely with the "zero waste initiative" being pursued by the RMWB. When the students explained the name they had chosen for the composting starter kit (CALMpost) I was even more pleased. It stands for "Create A Life with Meaning", and once again this is a personal and business philosophy I can get behind. Even more than the slogan, though, I can get behind a group of high school students who devote their scarce free time and their efforts to learn about economics and business. I find their drive and enthusiasm inspiring, and I suspect this is just the very beginning of many more new Junior Achievement business ventures in the future in our community. So, to The Great Green North, the students, and their advisors, I saw thank you for bringing Junior Achievement back to Fort McMurray. Thank you for creating a life with meaning - and I don't mean by selling composting kits but by being involved in our community with your young entrepreneurship. As an adult it can be easy to be jaded and think that few care about our world or our community, so to see young high school students creating and operating a business, and one designed to make the world a better place while educating people on the value of reducing our ecological impact, does the heart good. I invite all my readers to "like" The Great Green North Facebook page or follow them on Twitter - and maybe send them a word or two of encouragement for their venture, or even inquire about their products. I believe students like this not only need but deserve the support of our community so that one day they become our leaders - our business owners, our doctors, our lawyers, and our elected officials. 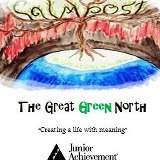 I know that Junior Achievement had a profound effect on the lives of my nieces and nephews, all of whom I am proud to say have gone on to successful careers as adults bolstered by the knowledge and confidence they gained from programs like JA. And frankly on a very personal note I wish I had been involved in JA as a youth because then maybe I wouldn't have struggled to run my freelancing business this past year and almost had a heart attack at filing my GST - but I digress. There you have it, Fort McMurray. Junior Achievement, composting, and involved youth are alive and well in our community. I thank them for sharing their time and story with me at the spring trade show - and I hope all my readers will check them out and if you happen to have an interest in learning about composting, well, The Great Green North might just be the ideal place to start!